A look at a few powerful optimizations that mitigate some of the performance problems with Go’s garbage collection, including embedding structs, sync.Pool, and reusing backing arrays. The authors of the new The Go Programming Language book answered 12 questions submitted by the Slashdot community. Borne from discussions at GopherCon 2015, the Go community now has a code of conduct aimed at making it clear what behaviors are and aren’t considered welcome. Line-by-line coverage reports stats help spot gaps where bugs hide. 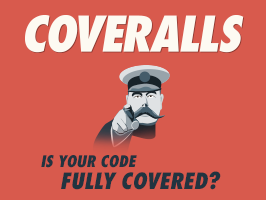 Get notified when coverage changes on your projects. Can't use cloud services? Check out Coveralls Enterprise. Always free for open-source, and we're looking for skilled devs to join the revolution. This is an open source community project and you're encouraged to contribute your own pithy pieces of Go wisdom. Provides a buffered io.Writer that is flushed at a timed interval. Converts a blob of text into a list of sentences. Get familiar with concepts like ES6, promises, prototypal inheritance, async coding, and more.